Eight of Pentacles (R) says you could be going about things the wrong way and need guidance – be willing now to listen to your “inner” voice. Your own impatience is creating this frustration and these unfulfilled ambitions. You can not take shortcuts to success – proceed in the proper way – attend to details and utilize your organizational skills. There must be order and trust – prudence and wisdom are the qualities of “not pushing” to make things happen, not resisting or holding back – but flowing naturally with the direction being presented. When your ambitions are limited or your view point is too near sighted, when you find that you are too concerned about your “ego” and image – recognize that these surroundings provide the sense of “false security” which is causing you to want quick results and not to be content to work and learn in the proper manner. Feelings which result from unsatisfying work – a job or career which calls for no skills, no personal involvement and no pride in the work that is being completed. You may be too attached to your work or to exercise, production of more than can be used/stored efficiently and without waste. Over reliance on teamwork, networking or lack of professionalism – even clumsiness. What are you working on preparing ahead of time? Next to Fool: Do not become careless in your work or finances just because things appear to be going well – there is a need for caution. In the first position: You will work intimately with the products of this good earth and with much efficiency and productivity. You may or may not enjoy or even care to enjoy, conventional material comforts. Your work and your products are your reward, not money. In the second position: You may not be giving enough attention to your resources and what is left behind once you use them up. You may have produced or stored far more than you need. In the third position: More work and more perfection is not the answer – you do not have to do everything – some things are better left undone. In the fourth position: The passion for work or for appreciation of material things may be excessive. This is not materialism in its negative contemporary, shop until you drop, sense – but rather, simply an over-involvement with the beauty of a given material or object – like wood or Ming dynasty vases. In the fifth position: On one extreme, you think that you have done all that you can do and that it may not be enough; what have the others done? Another extreme is that you are not content with your work, either the quality, the quantity or both. In the sixth position: On the one hand, you may be much too engrossed in your work or physical activity. On the other hand, you may have difficulty keeping up your level of energy and desire to pursue your work or physical interests. 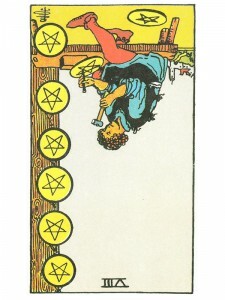 In the seventh position: Your success may be somewhat daunting to others, even to yourself in some respects. Another extreme is that you intellectual interest in your work, your physical activities or in material matters is on the wane. In the eighth position: The output may not be going according to plan or desire. Could the plans and the production be going too well? Will the process stop when you want it to? In the ninth position: For you, what you are doing is solving everyone’s problem, not just yours. But look around, is it really? Your work may be so introspective and sheltered that it is losing the very validity that you cherish. Have all the right people been involved? Or, too many? In the tenth position: This suggests that you may be attempting the wrong thing or too much of a good thing. On the one hand, your product may be the wrong product or not good enough for the situation. On the other hand, it may be too good and therefore inappropriate.